MEC Lesson 1 – What is mathematical proof? The topic for this Math Explorer Club is mathematical proof. In this post we will go over what was covered in the first session. The word proof is a normal English word that you might hear in normal speech. Here are some examples. In mathematics when we use the word proof we mean something different. Consider the following familiar theorems of mathematics. 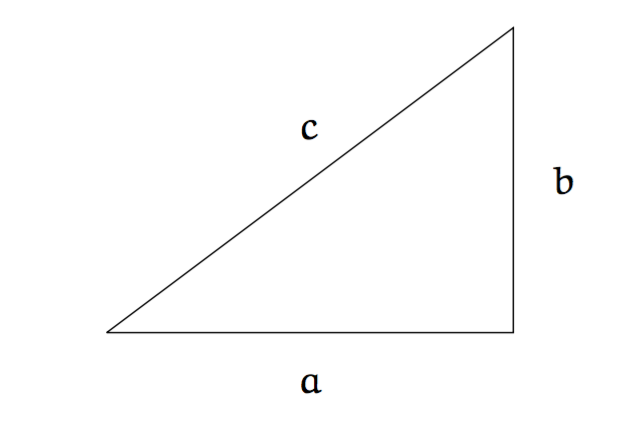 Consider the right-angled triangle with side lengths and as below. Or in words; the square of the hypotenuse is equal to the sum of the squares of the other two sides. Pythagoras’ theorem was known to the ancient Greeks, over 2000 years ago! the solutions are given by the following formula. Quadratic equations have been studied as far back as the Babylonians. General solutions to quadratics were known by ancient Greeks, and are thus also thousands of years old. This begs an important question. Why is it that these results, which are thousands of years old, are still to this day being taught in schools all over the world? The ancient Greeks used to think the world was flat and that Zeus lived atop Mt. Olympus. Why is it that some of their ideas remain true today, while others have long been replaced? The answer is mathematical proof. Before we say what a proof is, we must actually start by saying what a proof is not. A non-proof that the world is flat. Why did people believe that the world was flat? Well if you look around the world does usually look flat. Okay, perhaps there are some hills nearby, but generally speaking the world doesn’t look like a sphere to us. In fact, everyone you meet would also probably have experienced a flat world (unless you find yourself having lunch with an astronaut!). This led people to thinking the world was flat because every example they had showed it to be so. What would be the equivalent non-proof of Pythagoras’ theorem? We could draw lots of right-angled triangles and measure their side lengths and see if they satisfied the equation . If this works for every example we do (and it would!) then would we be satisfied that we had proved the theorem? The answer is no – this is not something a mathematician considers as a mathematical proof. And it is because our examples could be misleading. Perhaps there are some examples for which the formula doesn’t hold. If mathematicians accepted proofs like this we would end up proving things like ‘the world is flat’, and that, as we know, is not okay. So lesson 1 is the following. What we need to do to give a mathematical proof is to provide an argument that works in general. Something that works for all possible right-angled triangles. That is exactly what we will try and do in this next worksheet. Well done! We just proved Pythagoras’ theorem. This proof means that this theorem was true 2000 years ago, it is true now, and it will still be true in 2000 years time! Isn’t that amazing?